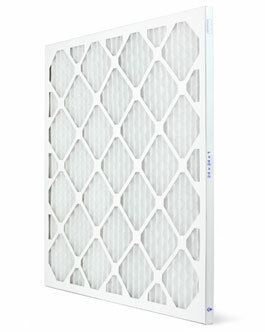 The AmAir 1100 filter is being replaced by the MERV 11 allergy reducing pleated filter. High Efficiency pleated air filter with electrostatically charged synthetic media. Highly efficient electrostatic filtering material attracts dust and pollen like a magnet. Captures microscopic airborne dust, pollen, mold spores, pet dander, and other particles that can irritate your lungs. This filter offers premium performance and construction with a high dust holding capacity. Rated MERV 11. Lasts 90 days. Available in 1", 2" and 4" depths and custom made sizes. MERV 11. Lasts 90 days.